On September 11, 2001, and in the weeks following that tragic day, President George W. Bush demonstrated compassion, empathy and love for his fellow Americans, while also showing the world strength and resolve. Actually ISIS and Al Qaeda have never misquoted sharia (Islamic law) in furtherance of their actions, and there is only one “version” of Islam – the one that commands jihad until the world is under Islamic rule. 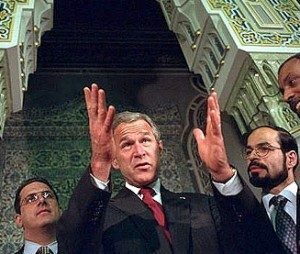 As the weeks after 9/11 rolled on, the Bush administration, like the Clinton administration before it, relied more and more on Muslim advisors inside the U.S. government to tell it about the “terrorist” threat and how to deal with it. 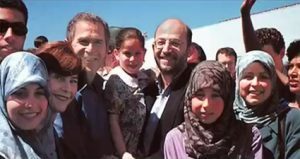 Karl Rove and Grover Norquist brought jihadis (“terrorists”) like Abdurahman Alamoudi (Al Qaeda), Sami al Arian (Hamas/MB), Suhail Khan (Muslim Brotherhood) and others into the Bush camp. The Bush team believed working with “moderate Muslims” was the path to success. As a matter of fact on 9/11/2001, suit-wearing jihadis from prominent U.S. Muslim Brotherhood/Hamas organizations were scheduled to meet with President Bush at the White House to get him to fulfill his promise to shut down legal proceedings using classified evidence unavailable to defendants (read: “terrorists”) – a proposal driven by Hamas/Palestinian Islamic Jihad leader Sami al Arian. Following this course led to the U.S. losing wars in Afghanistan and Iraq despite the fact our military crushed our enemies on those battlefields. It also led to disastrous domestic counter-terrorism strategies. This course failed because we relied on sharia adherent jihadis wearing suits to provide insight to U.S. National Security professionals and elected officials how to fight the war. This course continued and accelerated under the Obama administration, and today there is no training program inside the U.S. government teaching federal agents in the FBI, DHS, the military or anywhere else about the enemy’s threat doctrine – sharia – nor about the Muslim Brotherhood’s jihadi network here and how it operates inside our system. We are strategically blind to this threat. (1) Establishment Republicans who still view Islam as a “religion of peace” and defend Islamic leaders in the U.S. despite the evidence on the table most of them are jihadis, and (2) an absence of deep knowledge of the enemy’s doctrine (sharia) and how they operationalize it. Last week’s UTT article discussed item #2. Item #1 is the focus of today’s discussion. This week President Bush’s daughter Jenna proudly republished her father’s 9/17/2001 speech from inside the Islamic Center of Washington, D.C. in which he proclaimed “Islam is peace.” Really? Karen Hughes, one of President Bush’s closest advisors who is the former Under Secretary of State for Public Diplomacy and Public Affairs, sits on the board of the pro-jihadi organization Institute for Global Engagement (IGE). Karl Rove, the architect for much of President Bush’s plans after 9/11, has never admitted any of his policy recommendations were failures with regards to the Islamic threat nor has he changed his positions despite the fact we lost the wars in Afghanistan and Iraq. Yet today, Rove retains significant status in the Republican party. Arguably two of the most venerated U.S. Senators – John McCain and Lindsey Graham – have already demonstrated on numerous occasions they have no understanding about the Islamic threat America faces, cannot determine friend from foe, and publicly chastised President Trump for freezing immigration from nations hostile to the United States. This is all pertinent because some of the key positions inside the new administration are being filled by former Bush administration personnel, including the new Assistant to the President for Homeland Security and Counterterrorism Tom Bossert. U.S. strategies aimed at “Global War on Terrorism” failed under the Bush administration when the U.S. government wrote constitutions in Iraq and Afghanistan in 2005 creating Islamic Republics under sharia, thus achieving Al Qaeda’s regional objectives for them. This is the price of having no deep understanding of the enemy, their strategies, nor their modus operandi. As President Trump continues to push his agenda forward to secure the United States, the primary point of friction will come – at a critical time – from establishment Republicans. The same people who helped propel our enemies into the halls of power under the Bush administration and who were mostly silent under the Obama administration – save a few heroes like Bachmann, Myrick, Cravaack, Gohmert, and others – will continue along the road of blissful ignorance or direct hostility towards any aggressive actions to actually defeat the Islamic Movement. Why is this important to average Americans? Because it’s your safety. It’s your future. As UTT continues to state, this war will be won or lost at the local level. Even if President Trump does everything he promised and acts flawlessly as our Commander in Chief, local and state police must carry the burden to identify and uproot the enemy from their communities. Currently, they are not prepared to do it because they have not been trained to do it – save for those trained by UTT. By and large, they cannot identify the threat and, therefore, cannot deal effectively with it. This is UTT’s mission, and we are working with state and local officials to prepare them for the coming battle. It is what we do. This mission will have a much greater chance of success if those at the federal level also had a deep knowledge of this threat, and support these endeavors at the state and local level. Facts don’t cease to exist regardless of how long they’re ignored; thus the choice is clear, either iconoclasm or repose, not both; and we err at our peril, since marches on. Bush 43 is to Karl Rove,Charlie McCarthy to Edgar Bergen, thus said exactly what he was told to say in the aftermath of 9/11, as he also naively did on 20.09.01 inside the Washington mosque, and yet again after sending 4000 American marines, infantrymen, special forces and a variety of others to their deaths in Iraq under the guise of obviating an imminent threat posed by weapons of mass destruction which did not exist, I.e. to avenge a death threat to his father by Saddam Hussein; thus his obvious sense of relentless relevant guilt evinced by mea culpa bicycle rides on his ranch. Furthermore, 43s proxy quest for campaign funding from the Middle-east began long before he was ever elected, which suggests why the existing quid pro quo influential embedding of Muslim Brotherhood jihadists making decisions at the apex of U.S. political power exists. Furthermore, by having facilitated the immediate flight of the entire bin Laden clan from the country as the remains of the Twin Towers continued to smoke, obviously in order to obstruct the FBI’s interview needs, the White House arguably provided aid & comfort to the enemy in time of war, which constituted treason, and other “high crimes”. I.e., the Republican establishment has a tiger by the tail, and dare not let go. According to a narrative on truthdig.com, John McCain, the son & grandson of United States Navy admirals, was not only responsible for the explosion death of 134 crewmembers of the USS Forrestal, and for maiming involving the loss of arms. legs & eyesight of 161 others who were attempting to extinguish the ensuing fires it caused, but in the immediate aftermath of the disaster, rather than rendering on-scene assistance, command and/or control, fled below to the hangar deck, paused briefly there, then proceeded to the pilot’s ready-room and watched his shipmates being incinerated on a closed-circuit TV. Furthermore, per said narrative, his versions of what happened ostensibly differs dramatically from the official report. Two days after the carnage took place, John McCain and a journalist from the New York Times left the aircraft carrier in a helicopter and flew to Saigon; within the ensuing week, he is alleged to have been in, I believe, Monte Carlo drinking, gambling and reflecting on whether or not he would ever again drop napalm. John McCain, who in addition to having his smiling face photographed with Islamic terrorists in Syria, (or in Iraq), terrorists whom he advocates arming with American weaponry with which to depose Bashar Assad, the President of Syria, also met with Andrew Wood (British Ambassador to Moscow 1995-2000) at the Washington based, Halifax International Security Forum, in Nova Scotia, in November 2016, who, because McCain was allegedly “concerned” about the compromising nature of a dossier on then President elect DJT containing 35 pages of bogus pornographic filth allegedly amassed by the Russian Federation (which he took possession of, and subsequently provided to FBI Director James Comey) vouched for the integrity of it’s author i.e. an Arabian born former intelligence officer & British spy named Christopher David Steele DOB 24.06.64, currently a private intelligence consultant at Orbis Business Intelligence Ltd. in London (of which he is co-founder). Steele was allegedly known as a confirmed socialist while attending Girten College in Cambridge, in the U.K. Orbis Director, Christopher Burrows refuses to confirm or deny that his firm had produced said dossier, which with respect to financing was linked to a binary political source of Republicans & Democrats.